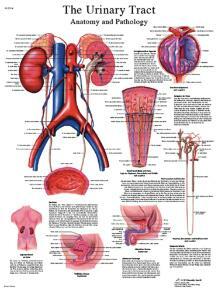 The anatomy of physiology of the human urinary tract is illustrated on this colorful anatomical chart. The microanatomy of the renal corpuscle, cortex and medulla are included in this poster. The anatomy chart includes other useful information about the urinary tract system, making it a great educational tool!